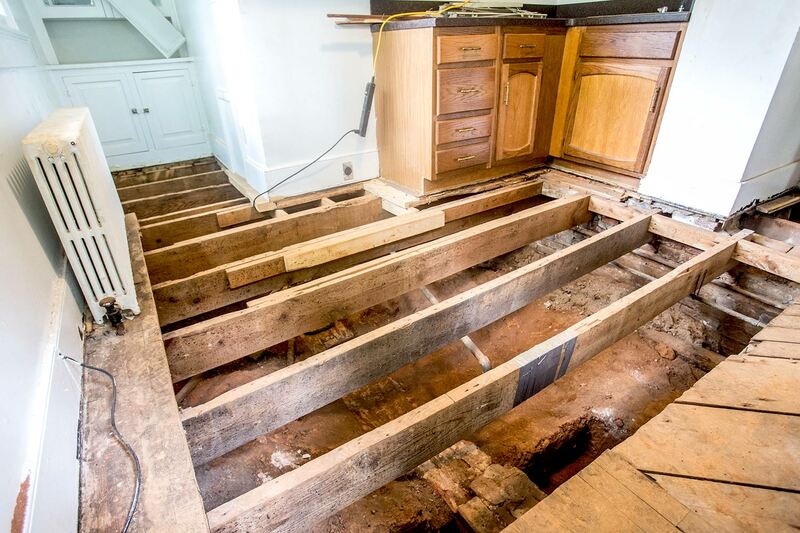 University of Virginia Facilities Management workers tore up the floor boards of the Pavilion III dependency and archaeologists uncovered pieces of Jeffersonian serpentine wall, foundation footings, shards of glass and pieces of bone — elements of a long-gone UVA. 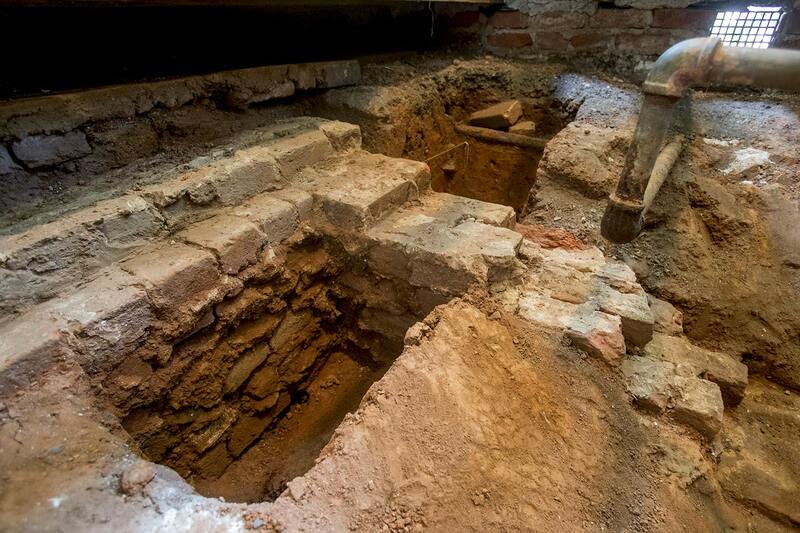 Archaeologists at the University of Virginia have found a 5 1/2-foot section of Jeffersonian serpentine wall underneath a 19th-century building that once was used as slave quarters. Researchers digging underneath The Mews, a 1,755-square-foot building behind Pavilion III in the Academical Village – the oldest part of the University, designed by founder Thomas Jefferson – discovered the section of serpentine wall and some of the building’s original floor, while the University’s Facilities Management workers unearthed a partial foundation of an extension that was attached to the original building. The Mews currently houses two apartments – the lower for Housing and Residence Life’s area coordinator, the upper used by the Provost’s Office for visiting faculty. The building has modern amenities and the wood floors in the ground level have been replaced and refinished. Facilities Management recently expanded the crawlspace underneath the building in anticipation of upgrading its utilities. 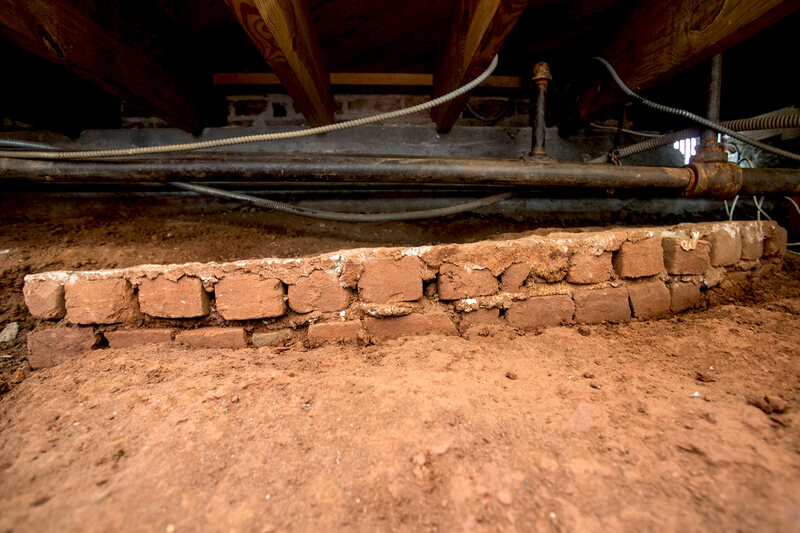 Since it was a project in the Academical Village, archaeologists from Rivanna Archaeological Services LLC were brought in to carefully examine the exposed soil underneath the floors of the building. Hogg said Jefferson did not specify how the gardens were to be used, leaving each of the 10 pavilions’ occupants to use the spaces to fit their needs. The core of The Mews was constructed around 1829 as a support building for Pavilion III, which was then occupied by law professor John T. Lomax. The one-and-a-half story structure contained a kitchen and slave quarters. Ben Ford, of Rivanna Archaeological Services, said the recently unearthed section of serpentine wall predated the original building by about seven or eight years, dating it among the University’s oldest structures. Straight brick walls that extended from the pavilion framed the upper end of the garden, and the kitchen structure was built using two of these garden walls as its exterior walls. A later addition also used a garden wall as part of the structure. The other remaining structures where slaves once lived are the Crackerbox, on the East Range near Randall Hall, and McGuffey Cottage, behind Pavilion IX. Some of the cellar rooms beneath the Lawn rooms on the east side and a handful on the west side were also likely spaces where the enslaved lived or worked. Von Daacke said Lomax may have requested the construction of a separate cook’s kitchen. Two other alterations came and went. In 1907, a porch was added to the west and south elevations of the structure, and in 1929, another porch connected the Mews to Pavilion III. Both porches were later demolished. An 1856 engraving by E. Sachse & Co., published by Casimir Bohn, depicted a small extension on the western side of the original structure. Rothery described it as “a small lean-to which could be converted into a kitchen.” Archaeologists believe the foundation remains recently found under the current kitchen are from that extension. Ford said Rivanna’s archaeologists found no evidence of the extension’s purpose, but said the foundation, while only 6 by 12 1/2 feet, was about 1 foot thick, unusual for a small lean-to addition. It was not centered on the original kitchen building and may pre-date that structure. 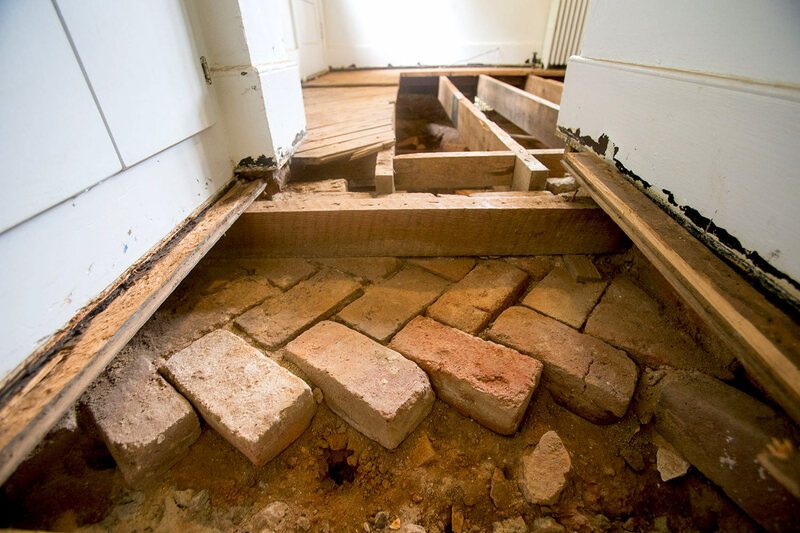 Rivanna archaeologists uncovered, in the original structure, a section of brick flooring in a herringbone pattern, which Ford thinks is part of the original kitchen floor . Shards of pottery and glass and some animal bones were unearthed near the original kitchen building. As part of the recent project, crews built access hatches into the floors so archaeologists can continue exploring underneath the building and workers can reach the utility lines. An interior staircase, removed when the building was divided, may eventually be restored if the building is returned to a single residence.